Ever since Meghan Markle and Prince Harry announced their engagement last year, there has been an endless conversation about which designer will create Meghan’s wedding dress. Everyone from Roland Mouret and Erdem to Victoria Beckham has been suggested, and this week the rumour mill pointed toward British couture house Ralph and Russo, who designed the £56,000 gown Meghan wore for the official engagement portraits. The wedding dress will come with a six-figure price tag—around £100,000, according to The Daily Mail. That might sound like an eye-watering sum, but six-figure dresses seem to be the going rate for the royals. Kate’s Alexander McQueen dress cost a quarter of a million, while Diana’s dress cost £115,000—in 1981. If the predicted sum is correct, Meghan’s dress—while astronomical to those of us who are likely to shop at Whistles for wedding attire—is one of the cheapest in the royal family history. Keep scrolling for the lowdown on the most noteworthy royal wedding dresses of all time. When Queen Letizia married Prince Felipe of Spain in 2004, she employed the Spanish couturier Manuel Pertegaz to design her dress. (The 80-year old designer had designed dresses for Audrey Hepburn and Jackie O.) Her dress consisted of a structured collar and cuffs embroidered with gold leaf. In 1995, the now-Crown Princess of Greece Marie-Chantal Miller married Prince Pavlos of Greece in a gown by Valentino. The ivory silk dress was encrusted with pearls and had a four and a half–metre Chantilly lace train. It took 25 craftspeople and 16 weeks to make and reportedly cost £167,000. 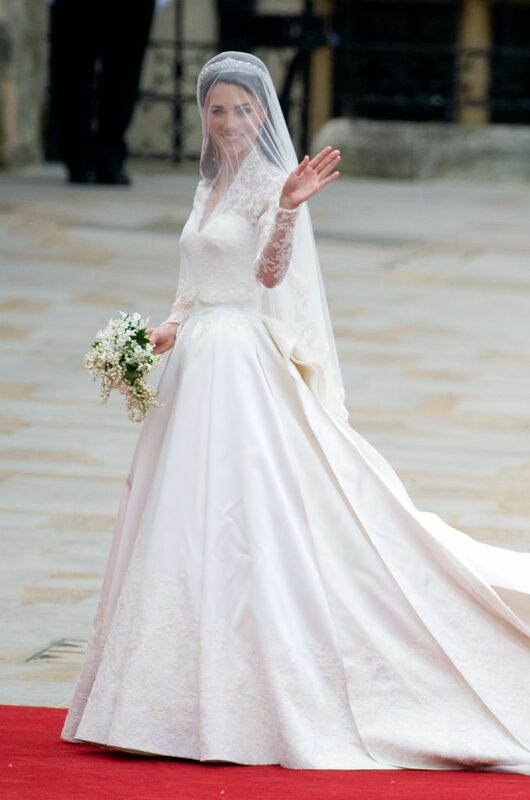 Designed by Alexander McQueen’s Sarah Burton, Kate’s wedding dress spawned countless copycats and is still today influencing bridal trends. The dress, which was crafted from ivory satin and lace, had 58 buttons up the back and a nine-foot train. It cost £250,000—easily the most expensive dress in the British monarchy’s history. The wedding itself cost a cool £24 million, although the royals insist that £22 million of that was spent on security. In 1981, Princess Diana married Prince Charles in Westminster Abbey at the tender age of 19. The wedding was one of the most watched ever: 660,000 people lined the procession route around the Abbey, while a further 750,000 tuned in to watch it on TV worldwide. Her dress, designed by Emanuel, was crafted from ivory taffeta and was embroidered with 10,000 pearls. The train is the longest in royal history, coming in at 25 feet. Her veil, meanwhile, was even longer, with 153 yards of tulle anchored to her head by a diamond tiara. The whole thing cost around £110,000. It was the Lebanese designer Elie Saab that conjured up the dreamlike dress for Countess Stephanie de Lannoy’s wedding to Prince Guillaume of Luxembourg in 2012. The gown, which cost $250,000, took a total of 3900 hours to make, with 3200 of those hours being dedicated to sewing on the 50,000 pearls by hand. The fitted bodice, meanwhile, was encrusted with 80,000 crystals.